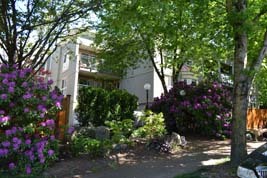 The Laura Jamieson Housing Cooperative is a 4-story apartment building with 47 suites located in East Vancouver. Access Code If you cannot remember your Access Code, insert any number into this field and an email will be sent to the email address provided with your Access Code. The co-op is NOT accepting any applications. Our waiting list is now CLOSED. We currently do not offer any subsidies. All applications received during this time will be confidentially destroyed. For all previous applicants, you will need to REAPPLY again when our waiting list status becomes "Open". 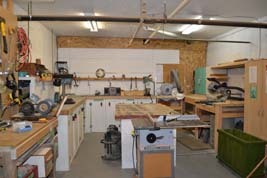 We do not keep any applications older than 12 months. ABOUT OUR COOP FAMILY Laura Jamieson Co-op is a community- and family-oriented housing co-operative. We value diversity and welcome single members and families in all their various compositions. We strive to make our co-op community reflect the range of cultures and ages, from babies to elders, found in the larger community that we are part of. Our children are an important and joyful component of our co-op and we believe that we all benefit from their presence and that living in a co-operative setting is a valuable experience for them. We all have rights and responsibilities and we want all members and their families to be comfortable and relaxed in their homes and in all the common areas that we share in our home. We therefore promote acceptance of all while ensuring all follow co-op rules, policies and procedures. 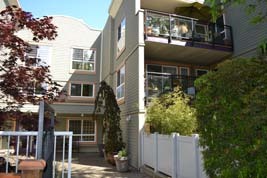 We are situated in the vibrant community of Grandview-Woodland and are only three blocks from Commercial Drive. "The Drive" sports a large assortment of culturally diverse shops, restaurants, cafes, theaters and is also home to some of Vancouver's favorite arts, music, and community festivals. With a public library, recreation centers, elementary schools, high-schools, and more only a short walk away - this is a truly great place to live! We are well served by BC transit: major bus lines run on Clark (#22 Knight to MacDonald) and Commercial Drive (#20 Victoria to Granville) and a short walk to the Broadway/Commercial Drive and VCC Skytrain stations Our namesake was born Laura Marshall, on a farm in Bruce County, Ontario, in 1888. At Owen Sound Collegiate, she became an outstanding debater and public speaker. In 1908, she graduated from the University of Toronto, having majored in philosophy. She eventually married and moved to B.C. where she became involved in public activities such as the University Women's Club and the Vancouver Suffragette Movement. The very core of Laura Jamieson's work and thinking throughout her life was social reform. She was appointed Judge of the Juvenile Court in Burnaby in 1926 and continued in that position for following 12 years. In the spring of 1939, Laura ran in a by-election and entered the Provincial Legislature. She was re-elected in 1941 but defeated in 1945. She fought for improvements in the Old Age Pension Act in order to make parents independent from their children. Prior to this time, parents were forced to sue their children for maintenance. From 1948-1950, Laura served as an alderman in Vancouver City Council. She once more became MLA for Vancouver Centre in 1952. From her experience as a Judge, Mrs. Jamieson came to believe that juvenile delinquency had to do with the world's problems today and that in delinquency cases, prevention is more important than a cure. In retirement, Mrs. Jamieson worked with study groups on socialism. She continued to promote the causes in which she had believed all her life. Commercial Drive has a large number of local ethnic stores and community groups, Edwardian-style heritage buildings, European-style cafes, bars, and alternative shops and entertainment venues.